Reporting Services allows you to write functions in C# or Visual Basic, then reference these as custom assemblies. This blog shows how - and why - you might do this. Sooner or later (probably sooner) you'll get sick of copying DLL files from your class library to your report server projects, and you'll start wondering why Visual Studio can't copy the files for you automatically. The answer is that it can, if you set up post-build events. 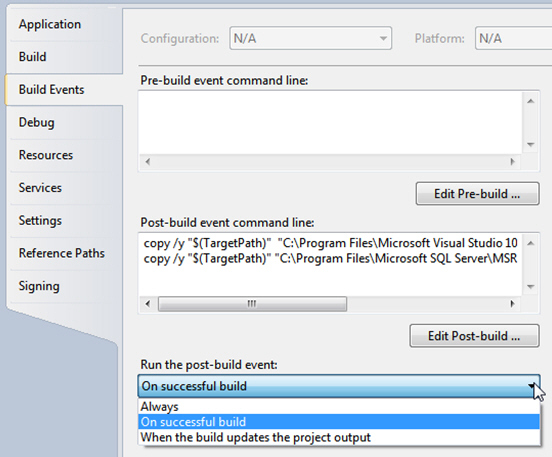 A post-build event is one which is triggered automatically whenever you build a project. 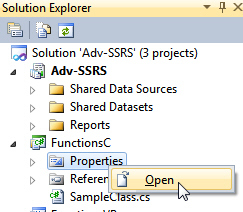 Right-click on the Properties category of the project in Solution Explorer, and choose to open it. 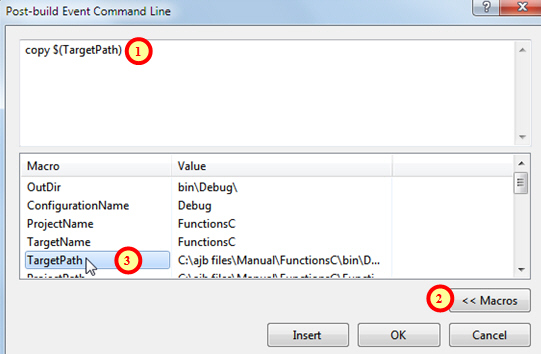 Click in the post-build event command line. Click on the Edit Post-build... button. 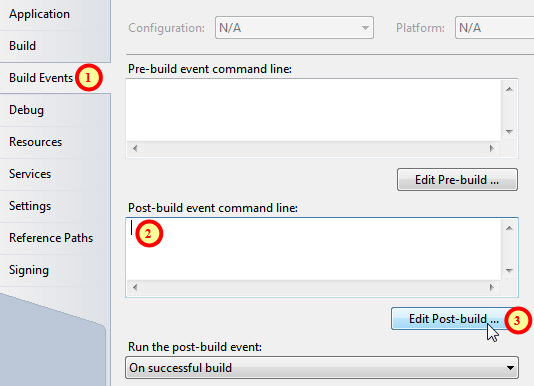 The numbered steps to follow to start creating post-build events. Start typing a valid command. Click on the <><> button to insert preset folder paths. Click on the folder path you want to use. The steps to follow to create post-build events. These commands are given in full below. copy /y "$(TargetPath)" "C:\Program Files\Microsoft Visual Studio 10.0\Common7\IDE\PrivateAssemblies" Copy the DLL built for the project to the Visual Studio report preview folder on the author's computer. copy /y "$(TargetPath)" "C:\Program Files\Microsoft SQL Server\MSRS10_50.SQL2008R2\Reporting Services\ReportServer\bin" Copy the DLL built for the project to the deployment folder on the author's computer. The /y switch means that SSRS will overwrite any files on the target folder. First right click on the VB class library project, and choose to display its properties. Click on this tab to go to post-build events. Click on the button shown at the bottom right of the dialog box. From this point, you can continue as for C# post-build events. There is one thing which catches me out every time! 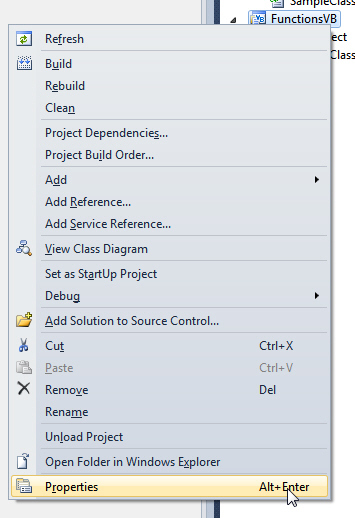 If you're previewing a report using a custom assembly, you won't be able to build the project (if it's using post-build events to copy the DLL over, that is) until you return to design view for the report.